Bion was a series of Soviet and later Russian biological research satellites carrying speciemens of diefferent organisms for life-sciences experiments. The Soviet biosatellite program began with the flight of Kosmos 110 (Voskhod type) and life-science experiments hosted on several Zenit-4 satellites, but later a dedicated design based on modifications of the Zenit-2 satellite design was created. These satellites, consisting of a spherical return capsule, a service module and a battery module, offered the opportunity for dedicated biological missions of up to 22 days duration. The first Bion launch was Bion 1 (Kosmos 605) launched on 31 October 1973. The satellite carried tortoises, rats, insects, and fungi on a 22-day mission. Other missions have also carried plants, mold, quail eggs, fish, newts, frogs, cells, and seeds. 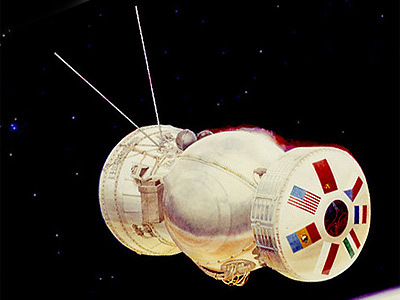 The Bion 3 (Kosmos 782) mission marked the first time that the United States participated in the Soviet Cosmos Program. Scientists from France, Czechoslovakia, Hungary, Poland, Romania, the U.S. and the U.S.S.R. participated in these investigations. Starting with Bion 6 (Kosmos 1514), these missions have carried pairs of monkeys. It was launched 14 December 1983, and carried the monkeys Abrek and Bion on a five-day flight. Bion 7 (Kosmos 1667) was launched 10 July 1985 and carried the monkeys Verny and Gordy on a seven-day flight. Bion 8 (Kosmos 1887) was launched 29 September 1987, and carried the monkeys Yerosha and Dryoma on a 13-day flight. Yerosha partially freed himself from his restraints and explored his orbital cage during the mission. On reentry, Bion 8 missed its touchdown point by 2977 km, resulting in the death of several fish on board due to the frigid weather. Bion 9 (Kosmos 2044) was launched 15 September 1989, and carried the monkeys Zhakonya and Zabiyaka on a 14-day flight. Temperature problems onboard resulted in the loss of ant and earthworm experiments. Bion 10 (Kosmos 2229) was launched 29 December 1992, and carried the monkeys Krosh and Ivasha on a 12-day flight. Bion 10 was recovered two days early due to thermal control problems that resulted in unacceptably high onboard temperatures. Seven of fifteen tadpoles onboard died as a result of the high temperatures. Both monkeys were treated for dehydration and recovered. One monkey also suffered weight loss when he went without food for three days. Bion 11 was launched 24 December 1996, and carried the monkeys Lapik and Multik on a 14-day flight. Tragically, Multik died the day after the capsule recovery during his post-landing medical operation and checkup. Multik's death raised new questions regarding the ethics of using animals for research. NASA has dropped out of participation in a planned Bion 12 mission. A further mission, Bion 12, largely repeat the experiments from Bion 11 to provide verification, was cancelled in 1997, when NASA cancelled their participation in the primate research. The Bion design was replaced by the Bion-M version, which flew first in 2013.